How fisheries impact the environment. Aquaculture, also known as fish farming has been practiced for hundreds of years, as a solution to the increasing demands for fish as a result of the increasing human population. Initially commercial aquaculture was thought to be a solution to the issue of wild fish stocks diminishing. While fish farming seemingly offers a solution to the decline of wild fish, currently over 70% of the worlds fish stocks are over fished or fully exploited (Wolff, 2008). This decline/exploitation is in part due to aquaculture. Aquaculture has its own set of very detrimental environmental impacts. One of the largest concerns pertaining to fish farming is, the crowing of fish in their contained environment. This crowding leads to water pollution. Fish wastes including, their excrement’s, uneaten food and dead fish ultimately end up in the surrounding waters (usually an ocean), polluting these waterbodies. The pesticides, and medications that are given to the fish also ultimately end up in the surrounding water (Wolff, 2008). Due to the high volume of fish, often these medications and pesticides are very concentrated and can affect entire aquatic ecosystems. Environmental pollutants are one of the major hurdles that most marine ecosystems are facing. Feeding the fish in the fisheries is also a large environmental concern. While some fish species are herbivores, the omnivores and carnivorous species must feed on other fish. This creates a need for feeder fish to be farmed, to feed the other fish. To create 2.2lbs of high protein fishmeal, it takes 10lbs of smaller fish (Wolff, 2008). This creates an issue in terms of the space available for farming fish, as well as pollution. 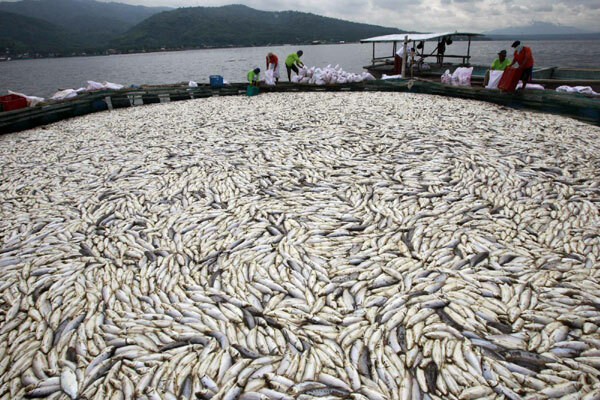 Approximately one-third of the fish caught globally is used for animal feed, which is a large increase from 1948 when only 7.7% was used for animal feed (Wolff, 2008). One of the largest environmental impacts of fisheries is the habitat and ecosystem alterations that are made to accommodate fish farms. Mangrove forests have been destroyed to create various aquaculture farms. The destruction of the mangroves has a large impact on the environment, which you can read about in my prior post. This habitat and ecosystem disruption is not only bad for the environment, but it is also bad for communities near the fisheries. The communities loose and assortment of ecosystem services these habitats offer, protection from natural disasters and economic benefits. Fisheries also pose threats to wild fish. Diseases from fish farms, such as sea lice, spread past the farms and are very damaging to the wild fish. Viral, bacterial and fungal diseases also have been known to spread to wild fish as a result of aquaculture (Wolff, 2008). You can help prevent illegal fisheries by donating or volunteering with Enhance a Village! Your donation will help to preserve mangrove forests and support sustainable fishery practicies.